Parenting » Dilemmas » What’s your parenting style? Experts have identified four basic styles: authoritative, permissive, authoritarian, and hands-off. Whatever your approach, here's how to make the most of your parenting style. As a parent, your approach to your child is as unique as you are. You can’t just wake up one day and be a different person because you read a book or watched a devilishly effective mother on the playground. Parenting isn’t only a collection of skills, rules, and tricks of the trade. It’s who you are, what your family culture is, and how you transmit the most personal aspects of your values to your child. But here are the facts: nearly 50 years of research have found that some parenting styles are more effective than others and show far better outcomes for children. Studies have identified four major parenting styles: permissive, authoritarian, authoritative, and hands-off. Of these styles, child development experts have found that the authoritative parenting style is the most successful in raising children who are both academically strong and emotionally stable. But the truth is, most parents don’t fall conveniently into this or any other single type; instead, we tend to be a combination of several parenting styles. The trick is to be flexible enough so that you make adjustments to your basic type — adapting your parenting style by adopting some best practices from other styles. Check out the following four types and to see how you can make the most of your parenting style to help your child thrive in school and in life. A. "Not a chance. You should know better than to ask me for one right before we have dinner." B. "OK, you’ve been such a good boy, you deserve a cookie." He seems to have his heart set and, after all, it’s only one cookie. C."No, you’ve already had plenty of treats – pick something healthy instead." D. "Don’t nag me. What I spend my money on is up to me." Are you frequently the parent who picks B? You’re not alone. Permissive parenting is common in this day of busy schedules, harried two-worker families, and a feeling that we just don’t get enough quality time with our kids. We love them to death! Why must we say, "No" all the blooming time? Unfortunately, indulging our children’s every wish can have unfortunate consequences both for the child and the parent. Children can end up feeling entitled to getting what they want, not what they need: the self-restraint, patience, and other character traits that will help them succeed in life. Parents who give in to the short-term battles about the extra toy or the chore that never gets done face bigger battles down the road when the child is used to running the show: fudging on homework, back talking parents, or simply not behaving responsibly. Here’s the ticket: your love. Permissive parents are deeply in touch with their overwhelming affection for their children, which is no small thing. The problem? Sometimes these parents aren’t thinking about the long-term consequences of their parenting choices. So don’t dismiss your desire to make your child happy. Instead, consider their long-term happiness a little more. When you find yourself in a permissive parenting conundrum, ask yourself, "What will make my child happy tomorrow, or next week, or in ten years?" The answer may make you seem a little stricter in the moment, but you’ll know that you’re acting from your deepest impulse, your love for your child. A. "I will help you, but get started on it on your own and do what you can." B. "It’s not my homework. You have to do it on your own. And make sure you do a good job or there will be punishments." C. "Why don’t I do your homework with you?" D. "I have such a headache. Please do it on your own or just skip it tonight. After all, it’s been a long day and I know how tired you are." Have you ever been the parent who chooses D? Hands-off or uninvolved parenting emphasizes learning through experience: you don’t shelter your children from the lessons that naturally happen from their mistakes. But it’s hard knowing when to let our children make their own mistakes. In times of our own stress or discomfort, it’s definitely tempting to tell your children you’ve had enough and they are on their own. The problem with this approach is that if it comes because of your mood, not your child’s needs, it can undermine her own motivation to, say, do well in school. You could argue that by not helping, you’re helping your child be more independent. But suggesting she skip her homework when she really needs help is not the time to teach autonomy. Your strength: you know that you’re raising an adult, not a child. The hands-off parent keeps the greater philosophical facts – every person must learn to take care of herself – in mind. But sometimes it’s easy for the hands-off parent to forget how long it takes to learn these obvious lessons. The next time you’re tempted to slough off a demand from your child on key issues around school or responsibility, recall that your child, while perhaps acting whiney and overly dependent, is asking for guidance. You don’t have to give in or be indulgent – but help them build a bridge to independence by breaking the problem down into smaller steps that they can do on their own. A. say, "OK, fine, you can go. But don’t expect me to help you get there. You have to find your own ride." B. ground them for talking back to you and questioning your judgment. C. say, "I want to sit down and talk to hear your concerns, but I’m not going to change my mind as long as I feel the party won’t be a safe place." D. realize they have a point – they should be able to go to a party all their friends are attending. You even offer to take them to the party, but because you’re concerned about safety, you wait in a nearby café and pick them up at the end of the night. Are you the parent that might choose B? No doubt, authoritarian parents do not accept the notion that the home is a democracy with the loudest voices winning. Old-fashioned rules help your children understand where they stand, what they are allowed to do, and what is expected of them. Unlike permissive parents who always want to be liked, authoritarian parents expect to be respected. The hitch is that strict, rule-based parenting can erode the affection and communication that makes children and parents stay connected emotionally. When children are very young, the strictly run household can look quite orderly and admirable, but as children grow into teens, experimenting with independence, they may be so afraid of their parents’ censure that they become secretive. Authoritarian parents can also raise children who never learn to speak up or think for themselves – two indispensable skills in the work world. How to make the most of authoritarian parenting? By all means, value your clarity, your high expectations, and your tough love. Then recall that your child may not know your strictness comes from love unless you make that abundantly and continually clear. In other words, you can show love without spoiling your children. This duality encapsulates the complexity of parenting: no one ever said it was simple. A. say, "It’s up to you what you choose to do. Besides, it’s only track — it’s OK if once in awhile you miss it." B. Offer to pick him up early from school and take him out for ice cream since you know he’s been tired out lately and needs a break. C. say, "I understand you don’t want to go and I know that feeling of doing something you don’t want to, but that’s precisely why I want you to go. Sometimes we have an urge to avoid tough stuff, but it’s important to do things even when they’re hard." D. say, "You have to go. No ifs, ands, or buts – conversation over." Are you the type of parent who will take the uncomfortable path to C? Congratulations! Authoritative parents have been found to have the most effective parenting style in all sorts of ways: academic, social emotional, and behavioral. Like authoritarian parents, the authoritative parents expect a lot from their children, but also they expect even more from their own behavior. They are willing to say, "No," or lay down the line, but they are careful to remain calm, kind, and patient about empathizing with the child’s perspective. It’s not easy to toe the authoritative line – it takes energy and time and sometimes herculean self-control. But there are great benefits to raising children who know you have high expectations and who maintain close emotional ties to you because there’s always been a strong bond of trust. If you aspire towards authoritative parenting, keep up the great work, but on occasion give yourself a break. Remember that no one is perfect and parenting is a process without a roadmap – don’t beat yourself up if you get lost once in a while. As we all know, getting a bit lost, then finding your way, is part of the journey. Carol Lloyd is the executive editor of GreatSchools and mother to two raucous daughters. 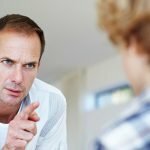 5 things to say when your child says, "You're not the boss of me!"